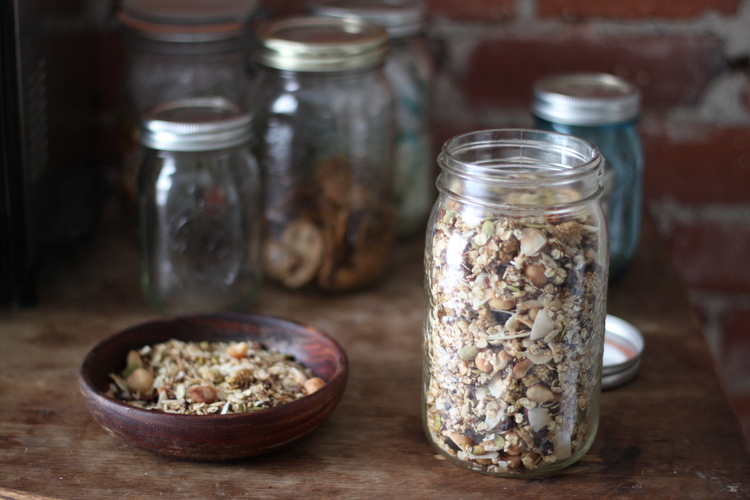 We love granola and are always looking for new and different spins on the traditional granola recipe. This recipe is still easy to make and uses some ingredients that are more unique than your average raisins. Walnuts are one of the best nuts because they provide omega3, which is only found in a small number of food sources. Omega 3 is the essential fatty acid that helps combat cellular inflammation, which helps maintain healthy cells and protect them from developing cancer. Although omega 3 is essential, our bodies can not make the fatty acid and the standard western diet is lacking in the proper amount of omega 3. That is why it is so important to make omega 3 rich foods, such as walnuts, a part of your daily diet. Macadamia nuts are a good source of MUFAs, monounsaturated fats, which is one of the healthiest forms of fat (olive oil is also a rich source of MUFAs). Although you might avoid macadamia nuts if you are trying to lose weight (because they are one of the most fatty nuts) they are a great choice for when you are going through cancer treatment, because they will help prevent weight loss. Mulberries are not well known in the western diet, however they have been used in Traditional Chinese Medicine for ages. Mulberries are a rich source of antioxidants and are an interesting and delicious substitute for raisins or dried cranberries (more often than not dried cranberries are loaded with extra sugar, so if you do buy them, make sure you find a brand that is fruit juice sweetened instead). Mulberries are a much better choice when you have cancer or are preventing cancer, because they contain less sugar than raisins. 1/3 cup of raisins contains 28.7 grams of sugar, while in comparison 1/3 cup of dried mulberries contains only 18 grams of sugar. Cacao is raw chocolate, which is what chocolate is made from when cacao beans are roasted and combined with various other ingredients such as sugar and milk. Cacoa beans (or nibs- when the bean has been broken into tiny pieces) provide all of the nutrients that have led to dark chocolate’s reputation for being healthy. Here is where you will find the compound that makes your body produce endorphins and feel good. One interesting fact to note, 1 ounce of caco nibs contains 9 grams of fiber, which makes them an excellent source of fiber that is also quite tasty. By eating cacao nibs you can get a chocolate flavour without any sugar! 2. Melt the coconut oil and warm with the coconut sugar and molasses or maple syrup. 3. Mix all of the dry ingredients together (except leave the mulberries, cacao nibs and coconut separate). 4. Mix in the liquid ingredients. 5. Spread out on a baking sheet and bake for 15 minutes, or until lightly browned. 6. Once the mixture is removed from the oven, mix in the mulberries, cacao nibs and coconut.